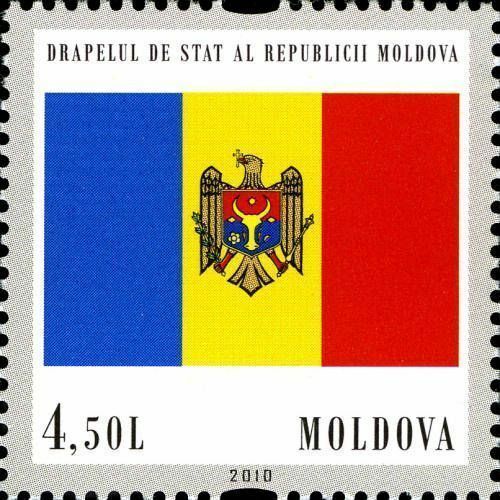 On 3 November 2010, the Post Office of Moldova (Poșta Moldovei) issued a series of postage stamps with the title 20th Anniversary of the Adoption of the State Flag and Arms of the Republic of Moldova. The issue comprises four stamps, with associated cancellation (postmark) and first day cover (FDC). The designer was Vitaliu Pogolşa. The printing was performed by Tipografia Centrală, Chişinău. 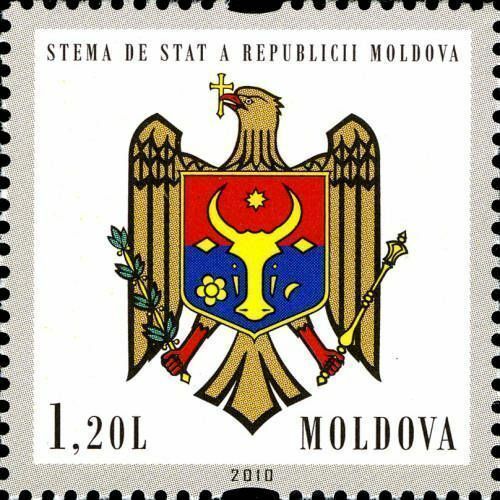 The coat of arms of Moldova consists of a stylized eagle holding a cross in its beak and a sceptre and an olive branch in its claws. According to the author[who?] of the coat of arms, the eagle symbolizes the Latin origin of the people. The chest of the eagle is protected by a shield that bears the traditional insigns of Moldavia: an aurochs head with the sun between its horns. It also contains two lozenges (the ears), a five-petal flower and a moon in a crescent phase. Everything on the shield has one of the three traditional colours: red, yellow, blue. The coat of arms appears in the centre of the flag of Moldova. Read more.. This article uses material from the Wikipedia article 'Coat_of_arms_of_Moldova', which is released under the Creative Commons Attribution-Share-Alike License 3.0.